One guy that needs no reassurance is Amazon founder Jeff Bezos. He is now the richest person in the world with a net worth of $155 billion. That's about $59 billion more than the $96.1 billion that the Microsoft co-founder Bill Gates is currently worth. These figures constantly change and are tracked by the Bloomberg Billionaires Index. “The Bloomberg Billionaires Index is a daily ranking of the world’s richest people. The figures are updated at the close of every trading day in New York.” You can check in on the world's richest 100 and see if you made the list at: https://www.bloomberg.com/billionaires/. You're probably thinking that with these numbers for regular workers you may never get to retire. Well, don't despair. The key for retirement may be as simple as choosing the correct location. Bankrate calculated many factors, including the cost of living, and came up with a best-to-worst list of states in which to retire. All you have to do in order to be the happiest in retirement is move to South Dakota. Whatever you do, avoid New York. The good news is that staying in Michigan may not be all bad. We rank fourteenth overall, fourth best in cost of living, and twelfth in lowest taxes. Of course, Michigan in fortieth in weather, but South Dakota is just above us at 38, so we're in the game. See the whole list and a nifty map at: https://www.bankrate.com/retirement/best-and-worst-states-for-retirement/. If you do want to retire eventually, it's a good idea to keep a close eye on the money you do have. This is particularly important this week due to a warning from the FBI. “The Federal Bureau of Investigation has warned banks in the U.S. of an impending cybercrime, a heist called an ATM cash-out, in which thieves seek to swipe millions of dollars by using cloned ATM cards for fraudulent withdrawals. This globally organized effort could be instigated soon, with cybercriminals attempting to amass millions of dollars within a few hours.” Yikes! Here's how it works: “To commit the crime, cyber criminals create fake bank cards by imprinting stolen credit card data on blank magnetic strip cards. At a per-determined time, the co-conspirators withdraw account funds from ATMs using these cards. Most ATM cash-out operations happen on weekends, usually just after the close of business Saturday.” Your bank is undoubtedly on the lookout for this suspicious behavior, but the FBI says you should be vigilant too. Again, yikes! Not all the money news is chilling. I love stories about cool new ways Americans are inventing to make money. Which brings us to the plastic straws controversy. “In the U.S. alone, consumers use as many as 500 million straws each day. That is more than one and a half straws for every American on a daily basis. That also is enough plastic straws to fill more than 46,000 school buses in a year or to stretch around the globe more than two times.” Most of these wind up fouling the environment. Knowing this, the story of Aardvark Straws in Fort Wayne, Indiana is really neat. “Aardvark is the only manufacturer of paper straws in the U.S. Its materials are sourced from a sustainably-managed forest that is in compliance with the Sustainable Forestry Initiative and the Forest Stewardship Council. It straws, made of natural cellulose paper, are also completely compostable and biodegradable.” Better yet, they don't collapse and work as well or better than plastic straws. Aardvark Straws is a great story, but I grew up in Flint, so any positive news coming from my hometown is near and dear to my heart. In terms of the continuing water crisis, you might wonder what happens to all those used plastic water bottles. Enter a new company – Genusee. (The name is a play on the county in which Flint resides, Genesee.) 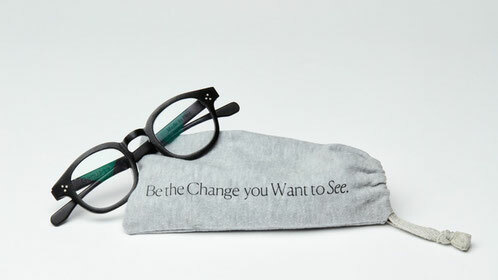 Simply put, they are using recycled plastic water bottles to make eyeglasses frames. Each pair of glasses is made from 15 water bottles. “The glasses are formed by injection molding. The plastic bottles are rendered down and turned into small pellets which are injected into casts to create the frames.” To start, Genusee will be launching one style of glasses available in two colors and with either single-vision prescription or tinted lenses. Delivery of the first batch will be in January of 2019. Pre-order yours at: http://genusee.com/ . Do good and look good in one swoop. How cool is that?